This FREE Monthly Income Statement Template features all 12 calendar months as well as a year to date total. The template calculates Net Sales, Gross Profit, and Net Income. This Income Statement has a classic and professional design. 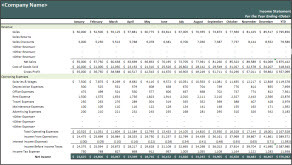 Enter your monthly revenue and expense figures, and the template will auto populate all calculated fields. Use the side-by-side layout to easily compare one month's profit to another.